L-asparaginase is a chemotherapeutic drug used in the treatment of lymphoblastic leukemia. 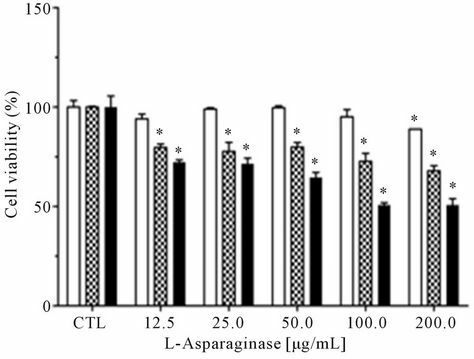 In the present study, the extracellular L-asparaginase produced by strain (PC-1.7.A) of Aspergillus terreus was purified, characterized, and modified with polyethylene glycol. Moreover, its antiproliferative activity was evaluated. The apparent molecular weight of the enzyme was found to be 136 kDa. The optimal pH and temperature for the enzyme were 9.0˚C and 40˚C, respectively. The enzyme retained 100% of the activity at 40˚C for 120 min. Pegylated L-asparaginase was more thermostable and more resistant to trypsin than native enzyme. Native L-asparaginase against human normal cells did not show cytotoxicity. However, in the leukemia cell lines RS4;11 and HL60 the antiproliferative effects of native L-asparaginase were observed after 96 and 72 h of incubation, respectively. For the first time, an L-asparaginase from fungus was evaluated as an antitumor agent in human cells lines and further investigations should be conducted to improve the knowledge about this enzyme. The enzyme L-asparaginase (L-asparagine amino hydrolase, E.C. 3.5.1.1) is an important component in the treatment of pediatric acute lymphoblastic leukemia (ALL) and catalyzes the hydrolysis of asparagine and glutamine into aspartic acid and ammonia. This conversion provokes the asparagine starvation in the blood plasma and induces the death of malignant cells, since they are unable to synthesize asparagine and reduced levels of asparagine inhibits protein synthesis in leukemic cells . Current studies of L-asparaginase therapy have also started in adults . The effect and half-life of L-asparaginase depends on some factors such as antibody formation, plasmatic proteases, formation of asparagine via asparagine synthetase and microbial source . Over the years, several bacterial L-asparaginases have been reported and only a few reports about L-asparaginase produced by filamentous fungi have been made. Among these reports are the L-asparaginase production by Aspergillus tamari, A. terreus , A. niger , A. nidulans , and in some yeast, but their antiproliferative activeties were not analyzed. Currently, there are three asparaginases preparations available for therapy, two of them are native and produced by the bacteria Escherichia coli and Erwinia chrysanthemi. The other one, also from E. coli is conjugated and its elimination half life is approximately six days, five times longer than the native E. coli and nine times longer than the Erwinia preparations [2,7]. The bacterial L-asparaginases are targets of antibodies and proteases, moreover side effects are observed during the treatment using this enzyme. Great efforts have been made to modify and immobilize these L-asparaginases in order to decrease their immunogenicity effects and increase their half-life. L-asparaginase from other sources, like eukaryotic microorganisms, should lead to an enzyme with less adverse effects. 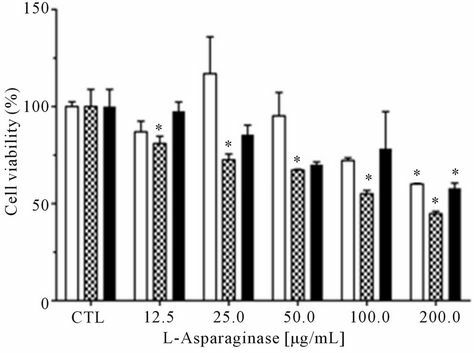 In this study, the extracellular L-asparaginase produced by Aspergillus terreus was purified, biochemically characterized, conjugated with polyethylene glycol and the antiproliferative activity of native enzyme was evaluated against two leukemic cells lines. Aspergillus terreus (strain PC-1.7.A) was isolated from Brazilian soil by Dr. S. Said and identified by Dra. C. M. S. Motta from Federal Pernambuco University (Laboratory of Taxonomy and Systematic of Fungi). The fungus has been maintained by weekly transfers on slants of PDA medium. Enzyme production was optimized in Czapek Dox’s modified liquid medium in two steps: the pre-fermentation medium containing 0.2% (w/v) glucose, 2% (w/v) L-proline, 0.2% (w/v) NH4NO3, 0.15% (w/v) KH2PO4, 0.05% (w/v) KCl, 0.05% (w/v) MgSO4∙7H2O and 0.001% (w/v) ZnSO4∙7H2O, FeSO4∙7H2O and CuSO4∙5H2O, the pH was adjusted to 8.5 with KOH, this medium was inoculated with 1 × 107 spores∙mL−1 and incubated at 120 rpm for 17 h at 30˚C. The culture was filtrated; the mycelium was collected and inoculated in the fermentative medium, which was similar to the medium used in previous step except for the absence of NH4NO3. The culture was reincubated for 96 hours at the same previous conditions. L-asparaginase activity was determined according Drainas and Pateman  and modified as follows: 0.6 mL 20 mmol∙L−1 Tris-HCl buffer, pH 8.0; 0.2 mL 100 mmol∙L−1 stock L-asparagine solution; 0.2 mL 1 mol∙L−1 stock hidroxylamine solution; and 1mL culture broth were mixed and incubated at 37˚C and 120 rpm. After 30 min 0.5 mL ferric chloride reagent [10% (w/v) FeCl3 plus 5% (w/v) trichloroacetic acid in 0.66 mol∙L−1 HCl] was added. One unit of L-asparaginase is the amount of enzyme that releases 1 mmol NH3 or aspartic acid per minute at 37˚C at the specific conditions just mentioned. L-glutaminase was assayed according to Imada et al. . The reaction mixture contained 0.5 mL of 0.04 M of L-glutamine; 0.5 mL of 0.5 M Tris-HCl buffer; pH 7.2; 0.5 - 1.0 mL culture broth (concentrated or not) and distilled water a final volume of 2.0 mL. It was incubated at 37˚C for 30 - 60 min. and the reaction was stopped with 0.5 mL of 1.5 M of trichloroacetic acid. In fact 0.1 mL of mixture just mentioned and 0.2 mL of Nessler’s reagent were added to 3.7 mL of distilled water. After 20 min, the absorption was measured at 450 nm. One L-glutaminase unit was defined as the amount of enzyme that liberates 1 μmol of ammonia per 1 min. The concentration of protein was determined by the Bradford  method with bovine serum albumin as a standard. 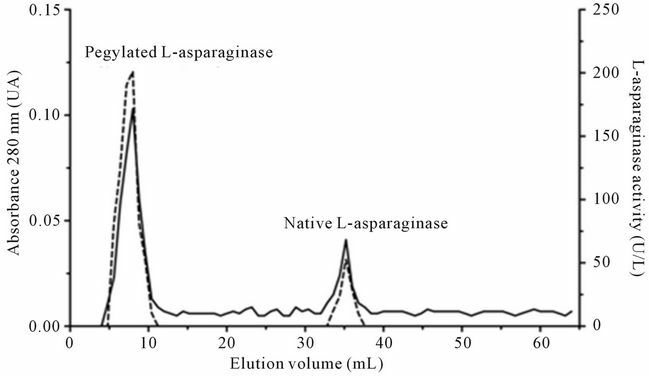 The extracellular L-asparaginase was purified in three chromatographic steps, and after each step, the fractions were analyzed for activity and absorbance at 280 nm. Step 1: The culture fluid was separated from mycelium by filtration. Then 900 mL was dialyzed against 5 mmol∙L−1 Tris-HCl buffer, pH 8.0 (buffer A) overnight at 4˚C, concentrated with polyethyleneglycol, and 20 mL were applied to a DEAE—Sepharose Fast Flow column (2.5 × 22.5 cm) pre-equilibrated with 20 mmol∙L−1 TrisHCl buffer, pH 8.0 (buffer B). The bound proteins were eluted by step-wise increases in NaCl (100 and 150 mmol∙L−1) at flow rate of 120 mL∙h−1. Fractions (5.0 mL) were collected. Step 2: The fractions with L-asparaginase collected from DEAE—Sepharose Fast Flow were pooled, dialyzed against buffer A, and loaded on a Sephacryl S-200 HR column (1.0 × 58.0 cm). The protein elution was performed with the buffer B containing 150 mmol∙L−1 NaCl at a flow rate of 9.6 mL∙h−1. Fractions (2.0 mL) were collected. Step 3: The fractions from step 2 that contained L-asparaginase were pooled, dialyzed against buffer A, and applied again on a Sephacryl S-200 HR column (1.0 × 5.8 cm) however the flow rate was reduced at 6.0 mL∙h−1. The fractions (0.8 mL) were pooled, concentrated with polyethyleneglycol, and dialyzed against buffer A overnight at 4˚C. The samples were assayed and used for further characterization. The pegylated form of purified L-asparaginase from A. terreus was obtained according to Soares et al.,  and adapted as follows: 2.5 mL of 50 mM phosphate buffer pH 7.0 containing 1 mg L-asparaginase and 20 mg activated m-PEG 5000 Da was maintained at 30˚C for 2 h and after this time it was kept at 4˚C overnight. Pegylated L-asparaginase was purified on a Sephacryl S- 200HR column (1.0 × 58 cm), equilibrated with buffer B and eluted with the same buffer containing 150 mmol∙L−1 NaCl at a flow rate of 6.0 mL∙h−1. Polyacrilamide gel electrophoresis (SDS-PAGE) as described by Laemmli  was performed using 4% (w/v) stacking gel and 7.5% (w/v) acrylamide slab gel at a constant current of 20 mA. 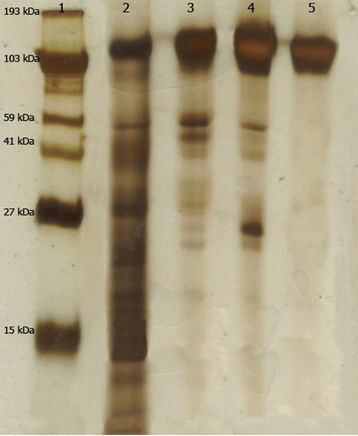 Protein bands were stained with silver nitrate according to Blum et al. . The optimum values of pH and temperature of purified enzyme were determined over a pH range of 2.2 - 10.6 (citrate-phosphate buffer [pH 2.2 - 7.8], Tris-HCl buffer [pH 8.2 - 9.0], and carbonate-bicarbonate buffer [pH 9.5 - 10.6]) and temperatures from 25˚C to 60˚C. 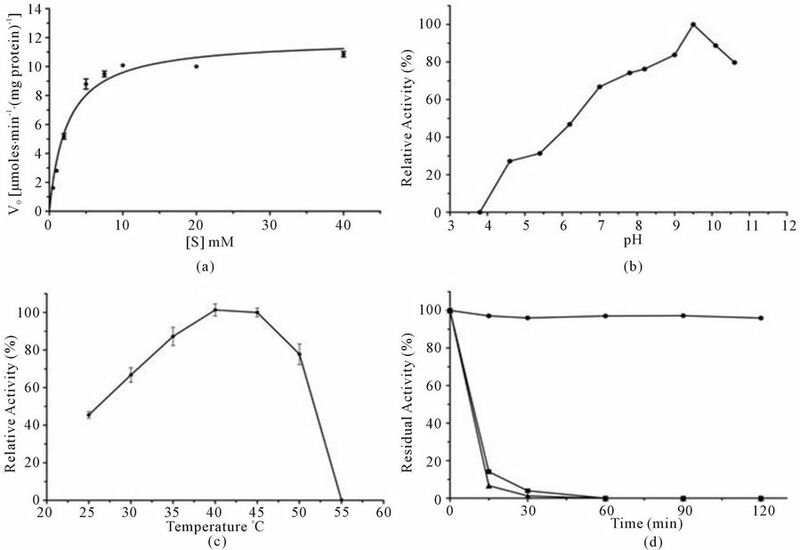 Km was determined from double reciprocal plots (Linewear-Burk) incubating the pure enzyme with different concentrations of substrate at temperature and pH optima. 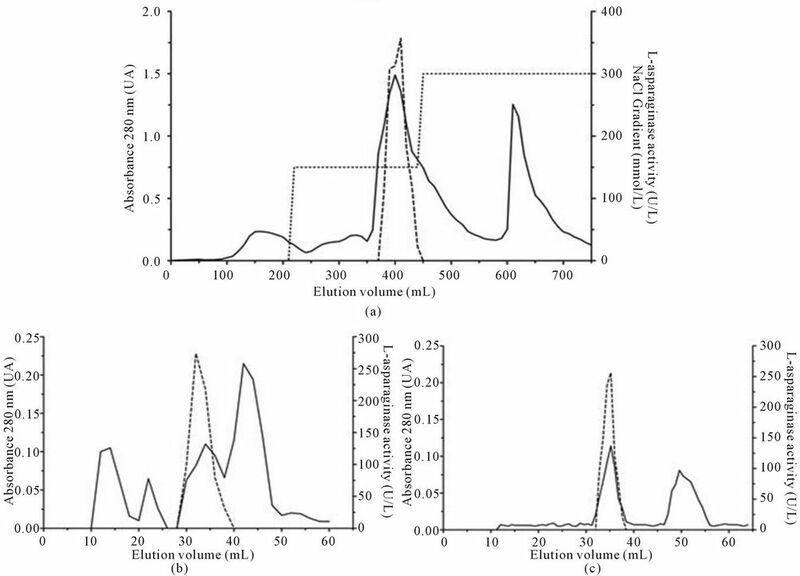 The molecular mass was estimated by chromatography on Sephacryl S-200 HR using different protein molecular weight markers: cytochrome C (12.4 kDa), α-lactalbumin (14.2 kDa), bovine serum albumin (66 kDa), alcohol dehydrogenase (150 kDa), and β-amylase (200 kDa). The column was pre-equilibrated with buffer B, the proteins were eluted with the same buffer containing 150 mmol∙L−1 NaCl at a flow rate of 6.0 mL∙h−1. The thermo stability of purified and pegylated L-asparaginase was determined by preincubating the enzymes in 100 mmol∙L−1 Tris-HCl buffer (pH 8.0) at different temperatures (40˚C, 50˚C, and 60˚C) for 120 min. Samples were collected at 15, 30, 60, 90, and 120 min, and the residual activity was assayed. Proteolytic resistance was evaluated after digestion of 180 µg of pure asparaginase and modified with 60 µg of bovine trypsin in a total volume of 1.0 ml at 37˚C. Samples were collected from each solution at 5, 10, 15, 30, and 60 min and assayed for the residual activity. All the stability studies were repeated in triplicate and values are shown as mean ± SD. The human leukemia cell lines HL-60 (pre-myeloid leukemia) and RS4;11 (leukemia with lymphoid and myeloid characteristics, Stong et al. were purchased from the American Type Culture Collection and were maintained in RPMI (GIBCO, USA) supplemented with 10% fetal calf serum, 100 U/mL penicillin and 100 µg/mL streptomycin. Human peripheral blood mononuclear cells (PBMC) were purified from heparinized venous blood drawn from healthy donors. PBMC were isolated by centrifugation on Ficoll-Paque (Pharmacia-LKB, Uppsala, Sweden) density gradients (1.077 g/mL) at 1000 rpm for 15 min at room temperature and subsequently resuspended in RPMI. All cell cultures were incubated at 37˚C in a 5% CO2 humidified atmosphere. The counting and cell viability tests were determined using the test of Trypan blue exclusion. Cells were seeded in 96-well plates at 1 × 104 cells per well. After 24 h, L-asparaginase was added at concentrations of 12.5 μg/mL, 25 μg/mL, 50 μg/mL, 100 μg/mL and 200 μg/mL. At different time points (48, 72, and 96 h) of continuous drug exposure, 10 μl of XTT dye (3 mg/mL) (XTT II; Roche Molecular Biochemicals, Indianapolis, IN) was added in each well. The plates were incubated for 2 h at 37˚C and the formazan product was measured at 450 nm by using an iMark microplate reader (Bio-Rad Laboratories). The experiments were performed in triplicate in three independent sets. Values are shown as mean ± SD. Cell survival was calculated by subtracting the background absorbance of media alone and then dividing the absorbance of test wells by the absorbance of the control (untreated) wells. The purification of L-asparaginase was carried out by three steps with a final yield of 7.28% and a purification fold of 10.67 (Table 1, Figure 1). The molecular weight of the native enzyme determined by its mobility on the gel filtration column and SDS-PAGE was estimated to be 136 kDa (Figure 2). The Km value of the native enzyme using asparagine as a substrate and determined from Lineweaver-Burk plot was found to be 2.42 mM (Figure 3(a)). The optimum pH for enzyme was found to be 9.0 and at physiological pH the enzyme retained 70% of maximum activity (Figure 3(b)). L-asparaginase exhibited the highest levels of activity at 40˚C (Figure 3(c)) and was stable at this temperature for until 120 min. (Figure 3(d)). The Km value of the pegylated enzyme using asparagine as a substrate and determined from the Lineweaver-Burk plot was found to be 2.51 mM (not shown). The Pegylated—L-asparaginase retained 93% of the original activity from the native enzyme, and it clearly eluted as a separated peak from the native enzyme (Figure 4(a)). It showed more resistance to proteolytic degradation than the native L-asparaginase maintaining about 45% of initial activity after 30 min in the presence of trypsin (Figure 4(b)). Both native and pegylated enzymes were stable after incubation for more than 60 min at 40˚C, but the pegylated L-asparaginase maintained 75% of enzymatic activity at 50˚C for 15 min while the native enzyme maintained only 13% at this condition (Figures 3(d) and 4(c)). Table 1. Purification steps of L-asparaginase produced by A. terreus. Figure 1. Chromatographic separation of L-asparaginase produced by A. terreus. (a) The crude extract was dialyzed, concentrated and applied to DEAE-Sepharose which was eluted in 20 mmol∙L−1 Tris-HCl pH 8.0 under a flow of 120 mL∙h−1; (b) The fractions containing enzyme activity were pooled and applied to gel filtration column of Sephacryl S-200HR with the same buffer under a flow of 9.6 mL∙h−1; (c) The fractions containing enzyme activity were combined and applied to gel filtration column of Sephacryl S-200HR with the same buffer under a flow of 6.0 mL∙h−1. The fractions collected were analyzed by absorbance in 280 nm (▬), enzyme activity (----) and step-wise NaCl (······). obtained from this assay using RS4;11 cells indicated a dose and time-response effect and the drug dose required to cause 50% reduction in cell viability in this cell was of 100 μg∙mL−1 after 96 h of incubation (Figure 5(b)). The leukemic cells HL-60 incubated with L-asparaginase had their cell viability by 50% in a concentration of 200 μg∙mL−1 in an incubation time of 72 h, but after this time, the cell viability increased again (Figure 5(c)). Figure 2. Polyacrylamide gel electrophoresis of purified L-asparaginase from A. terreus. Protein bands were stained with silver nitrate. Lane 1: molecular weight markers; Lane 2: Crude extract; Lane 3: Fractions contains L-asparaginase activity from step 1; Lane 4: Fractions contains L-asparaginase activity from step 2; Lane 5: Fractions contains L-asparaginase activity from step 3. Figure 3. Characterization of L-asparaginase obtained from A. terreus. (a) The Km value was determined by incubate the native enzyme at different concentrations of asparagines; (b) The optimal pH of activity was assessed by measuring the enzyme activity at different pHs ranging from 3.8 to 10.6; (c) The optimal temperature for activity was assessed by measuring the enzyme activity at different temperatures between 25 and 60˚C; (d) For thermostability test the native enzyme was incubated at different temperatures, 40˚C (- ● -), 50˚C (- ■ -) and 60˚C (- ▲ -) for a period of up to 120 min. Figure 4. Partial characterization of pegylated L-asparaginase. (a) Chromatographic separation between pegylated L-asparaginase and native enzyme. The enzyme mixture was applied to gel filtration column of Sephacryl S-200HR, pre-equilibrated with 20 mM Tris-HCl pH 8.0 containing 150 mM NaCl eluted under flow of 6.0 mL∙h−1. Fractions of 0.8 mL were collected and analyzed at A280 (-) and enzyme activity determined (----); (b) Stability of the pegylated and native L-asparaginase against enzymatic proteolysis. 180 mg of native L-asparaginase (- ● -) or pegylated (- ■ -) were incubated with 60 mg of bovine trypsin, for 60 minutes; (c) The thermostability of pegylated L-asparaginase. The enzyme was incubated at different temperatures, 40ºC (- ● -), 50ºC (- ■ -) and 60ºC (- ▲ -) for a period of up to 120 min. but toxicity reactions are attributed to this activity [17, 18]. Herein L-glutaminase activity was not detected in crude enzyme (concentrated or not) produced by A. terreus (PC-1.7.A) even after 60 min of the reaction. This should contribute significantly to diminution of side effects and it may be helpful in clinical practice. A manner of reducing the immunogenicity of L-asparaginase is covalently linking the enzyme with PEG, what may also become the enzyme more resistant to leukemic lysosomal cysteine proteases. It is important to know that the half-lives of E. coli asparaginase linked to PEG are longer than the native enzyme [3,17]. Herein the pegylated-L-asparaginase was resistant to trypsin, a cysteine protease, and was more thermostable than the native enzyme, as well maintained 93% of the original activity. Figure 5. Cell viability of leukemic cells after treatment with purified L-asparaginase from Aspergillus terreus. Cells (1 × 104 cell/well) mononuclear (a); leukemic RS4;11 (b) and leukemic HL-60 (c), were incubated in 96-well plates and treated with different concentrations of L-asparaginase for 48 hr ( ), 72 hr ( ) and 96 hr ( ). The tests were analyzed by the XTT method. The results represent mean ± SEM. Dunnett test (CTL-control group without treatment). from intracellular and extracellular sources [19,20]. 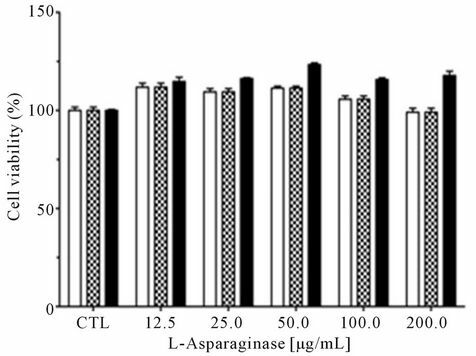 The results of the present study clearly indicate that the L-asparaginase produced by A. terreus (PC-1.7.A) has a molecular weight similar to the E. coli, does not present glutaminase activity and displays good results after pegylation. Moreover, this L-asparaginase caused antiproliferative effects on two leukemia cell lines. Altogether, these data prompted further investigations into the L-asparaginase produced by A. terreus (PC-1.7.A). This work is part of a thesis submitted by Claudio B. Loureiro to Faculdade de Ciências Farmacêuticas de Ribeirão Preto, Universidade de São Paulo, in partial fulfillment of the requeriments for the Master’s degree. CBL received a master fellowship from Coordenação de Aperfeiçoamento de Pessoal de Nível Superior (CAPES). C. Drainas and J. A. Pateman, “L-Asparaginase Activity in the Fungus Aspergillus nidulans,” Biochemical Society Transactions, Vol. 41, 1977, pp. 1365-1371. A. Imada, S. Igarasi, K. Nakahama and M. Isono, “Asparaginase and Glutaminase Activities of Microorganisms,” Journal Genetics Microbiology, Vol. 76, No. 1, 1973, pp. 85-99. R. C. Stong, S. J. Korsmeyer, J. L. Parkin, D. C. Arthur and J. H. Kersey, “Human Acute Leukemia Cell Line with the t(4:11) Chromosomal Rearrangement Exhibits B Lineage and Monocytic Characteristics,” Blood, Vol. 65, No.1, 1985, pp. 21-31. V. C. Foster and S. Said, “The Influence of Nitrogen Source on L-Asparaginase Production by Strain Isolated from Soil,” VII Seminário Brasileiro de Tecnologia Enzimática, Caxias do Sul, 21-24 May 2006, p. 124. V. I. Avramis and E. H. Panosyan, “Pharmacokinetic/Pharmacodynamic Relationships of Asparaginase Formulations: The Past, the Present and Recommendations for the Future,” Clinical Pharmacokinetics, Vol. 44, No. 4, 2005, pp. 367-393. E. H. Panosyan, R. S. Grigoryan, I. A. Ayramis, N. L. Seibel, P. S Gaynon, S. E. Siegel, H. J. Finger and V. I. Ayramis, “Deamination of Glutamine Is a Prerequisite for Optimal Asparagine Deamination by Asparaginases in Vivo (CCG-1961),” Anticancer Research, Vol. 24, No. 2C, 2004, pp. 1121-1125.